Princess #1… Snow White… of course! Over the last several months, since I began once again seriously collecting dolls, I have accumulated 4 Snow Whites out of the box. I have 1 in the box. So I got to looking at these 4 dolls. I figured since there is a bit of difference in the faces, and the dresses that they must be different some how. I looked online and could only place one of them. She is this one. She came in a set with the 7 dwarfs . This is the only one I have that came with shoes. None have the head gear. I thought maybe they had different manufacturers… That really confused me. I keep reading how Hasbro got the Disney doll contract and ALL these are Mattel… It turns out Hasbro didn’t get the Disney contract until 2016. Hmmm Does that mean the Mattel versions will become hard to find and “rare”??? This young lass I can’t place because she came to me neekid except for the gold ribbon on her neck. This one has a different shade of lipstick than the others, and no neck ribbon. Apparently some one decided her hands would be a good snack… eeww. Well I have taken my pain meds and it is now making me sleepy. Before I go, I want to mention a shopping app that I have begun using. It is called Ibotta. I used it today for the first time. It was fast and easy. If I were a couponer still, I bet I could save a lot on my groceries. The app has many stores to choose from, including walmart, cvs, heb and sams. Just to name a few. I did my test at heb. I picked the deals that were on things I needed anyway and went shopping. I came home, scanned the barcodes on the items then took pictures of my receipt. I now have $6 coming back to me. Plus a $10 bonus for joining up. You will get a $10 joining bonus when you file your first rebate, and I will get $5 for introducing you. I know I said I wasn’t going to post on Saturdays but…. OK so I read yesterday about a community sale. I decided to go to it first. A Barbie carousel with 3 Disney princesses in it, in their original dresses. Elsa even has 1 shoe… On looking closer after I got home Tiana has a chewed hand. Still, I didn’t have her yet! The other 2 dolls are in great shape. Now the only Princess I do not have is Aurora. The others I have multiples of. I plan to compare them in a post. Just to see if they are identical or have some differences. Elsa, is even a Disney store doll! My first! Beads for a project I am thinking about. A book of funnies… I almost didn’t get this. The gal at the sale told me they were only dealing with dollars no change… I offered .10c for the book. Fortunately I found something else. I bought that and she gave me the book for free. This cute little squirrel had to come home with me… literally… he was freaking out the lady hosting the sale. When I took him from her he began moving and squeaking and chirping… She said he is definitely yours… he likes you! I also found another beach barbie. I have her already but, the more the merrier! I also found this lass, she needs hair help but the crown might make figuring out who she is a bit easier! For ebay, or etsy, I picked up this Bunnykins set. Actually to be truthful, I got a lot more than just this. However I stopped by my friend’s shop and she bought the rest of it! I ended the day with more money than I started with. This is an extremely rare occurrence but a welcome one! Did you go saleing today? Find any treasure??? Since I have been under the weather all week I have not been able to sew. I have however done some digging in my sewing room. 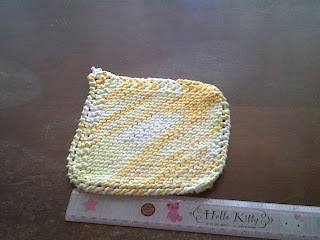 I discovered a few dish rags I knitted this winter. 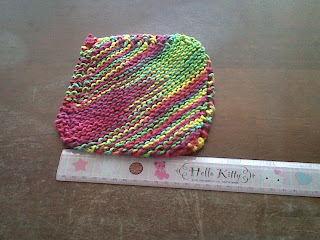 I knit in winter when it is too cold to go out and do other things. 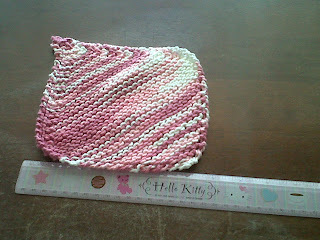 I knit when I need quiet and prayer time too. There is something calming about picking up the needles and a skein of pretty yarn and just letting my heart talk to God while the needles do their work. I was told I should put these on Etsy too. So I took pictures. They are very cheery. 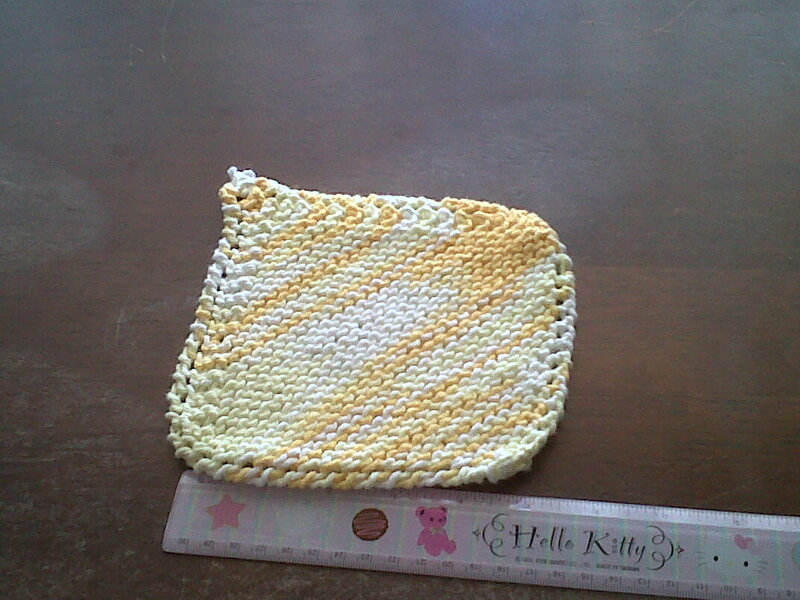 I have small hands and while sometimes I want a big dish rag some times I want a smaller one, easier to control too. They measure 5in x 5in. They take a shorter time to knit and less yarn too. 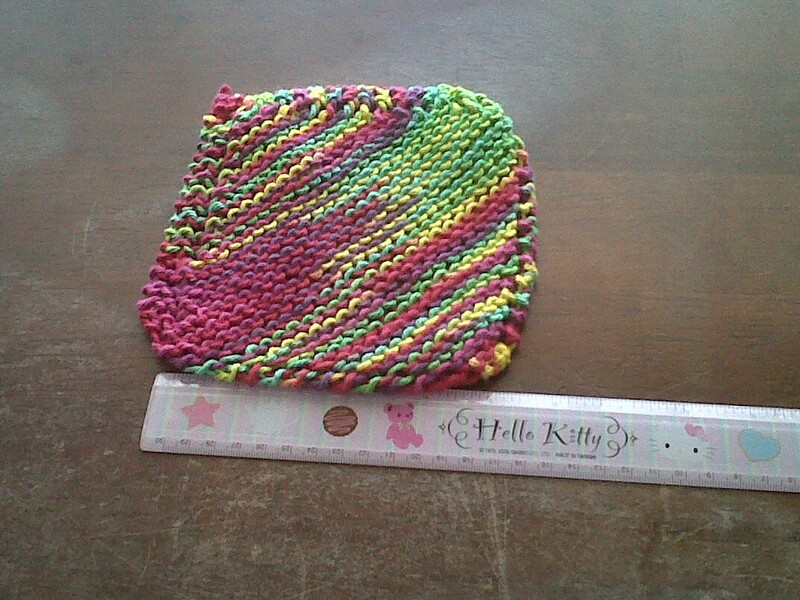 I only use sugar and cream yarn for these. 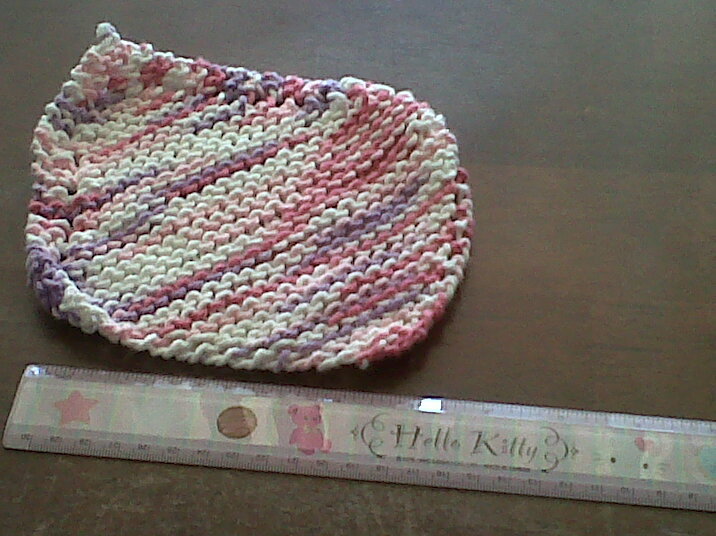 I do intend to make some bigger ones too, once I have more empty time on my needles! Keeps sewin’ (er knitting?) y’all! 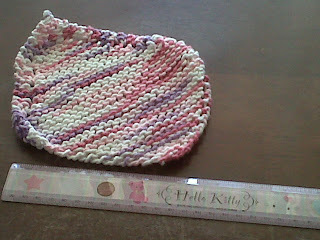 This blog is for discussing my and my daughter in love’s business, Prairie Homemaker Aprons and Accessories. This post is just a teaser guess, to let you know what is coming! For now I need to go get some apron work done! I will be back tomorrow hopefully with some pictures and Mel’s Philosophy of Aprons!